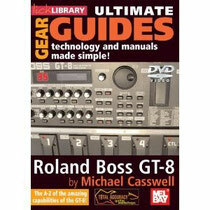 Learning how to use your Roland (BOSS) GT-8 has now never been easier thanks to the official Roland DVD Owner's Manual. 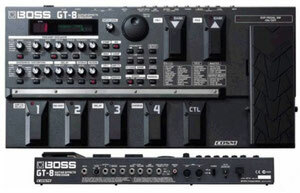 Double your power with BOSS’s GT-8 floor-based mega processor. Loaded with twin COSM® modeling engines, it brings unprecedented performance and tonal control to the stage and studio. The Dual COSM amp section provides two discrete amp channels; you can layer and manipulate each engine independently to create wildly expressive sounds. Thanks to the Solo Switch function, lead sounds can be immediately activated — perfect for ripping through the mix. Take your GT-8 skills to the next level and Grab the essential DVD Tutorial today! Get the David Gilmour/ Pink Floyd Sound - Then look to get the BOSS GT-8 TUTORIAL DVD MAKES WORKING AND CREATING A SYNCH! Not all multi-FX are equal. The GT-10 treads the fine line between features and durability, and it delivers. 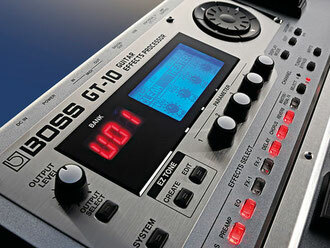 If you choose to delve a little deeper, there's a mind-boggling level of flexibility in the GT-10's signal chain. There are 10 modules and all can be used simultaneously.